Driving by as part of the Coatesville Christmas Parade, cartoon characters smile and wave at the spectators lining the streets. 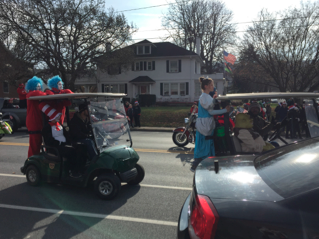 Over the past couple weeks, Chester County has had three Christmas parades, including parades in West Chester, Coatesville, and Downingtown. The first to occur was the West Chester Christmas Parade on Friday, November 30th starting at 7:00 pm. The main stage was on East Market Street but the parade route ran in a huge square onto East Gay Street, South Matlack Street, and New Street. The evening parade had many lights to illuminate the streets where people sat in the cold and breezy weather. The main sponsor for the parade was QVC. The parade not only had Santa as a celebrity figure; they also had special guest Catie Turner, a top ten finalist on American Idol. The next day, on Saturday, December 1st, at 10:00 am, the Coatesville Christmas parade began at the West End Fire Hall and ended at the borough tennis courts. The sunny morning was filled with cartoon characters, floats, and candy. The sponsors of the cartoon characters were Courtesy Chrysler, Jeff D’Ambrosio Cars, Giunta’s Furniture, Harrison House of Chester County, Hershey Motors, Landis Insurance, Milanese Remodeling, and Witmer Fire Store. Some of the featured cartoons were the Cat in the Hat, Thing 1, Thing 2, Cinderella, and Captain America. All were a hit among the children spectating along the parade route! The last of the local parades was the Downingtown Christmas Parade, which took place a week later on Saturday, December 8th at 3:00 pm. This parade started on Lancaster Avenue and ended on Whiteland Avenue in Downingtown borough. The cold afternoon parade featured plenty of firetrucks and our very own high school marching bands. Spectator and Downingtown resident James Harpel said, “My favorite part was the Chick-fil-a cows and the [coupon] cards they handed out.” The main sponsor was Downingtown Collision. We are lucky to have so many wonderful and festive holiday events within just a short drive from Downingtown West. If you didn’t make it out to a parade this year, be sure to try for next year. It’s a great way to get into the holiday spirit… and maybe score some free candy or Chick-fil-a!